Year after year, killer apps developed by organizations that rely upon technology to service their clients, face app killers like major outages, malfunctions, and security breaches that disrupt business and damage reputations. Sadly, nearly all of these failures had an architectural flaw that had gone undetected. The technical diversity that gives modern business applications their unique power and flexibility comes at a cost of staggering complexity. Quite simply, the complexity of modern business applications exceeds the capability of any single individual or team to understand all the potential interactions among the component languages and technologies. 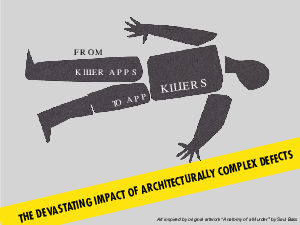 Organizations are now faced with the devastating impact of Architecturally Complex Violations. Download this ebook to learn why it is important to analyze applications across all languages, tiers, and technologies to improve operational performance and overall maintainability.